Courthouse 1728: The original Court Order for this building specified one of "40 feet long, and 26 feet wide, and 16 feet above the pavement." 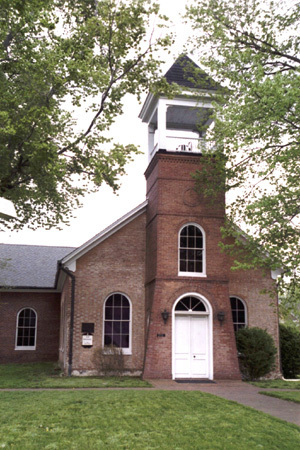 The building is of brick laid in Flemish bond with arched windows and is still standing (being that part of Beale Memorial Baptist Church, minus the front belfry and extending to the first addition). It was used for Court until it became too small, and in 1848 another building was erected. In 1815 the building was partially burned by the British but was restored for use. In 1937 a bronze marker was installed on the old walls by the Henricropolis Chapter of N.S.D.A.R. (National Society of Daughters of the American Revolution). Since 1875 it has been a Baptist Church, now known as Beale Memorial Baptist Church. In 2004 the building was sold to Essex County as the church moved to a new location North of Tappahannock.